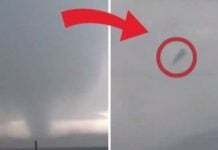 April kicks off what is typically the most active and dangerous three-month period of the year for tornadoes in the United States. During the 20 years from 1997 to 2016, the U.S. averaged 1,225 tornadoes annually, 55 percent of which were sandwiched between April and June. Historically, May has seen the most tornadoes each year with an average of 275. 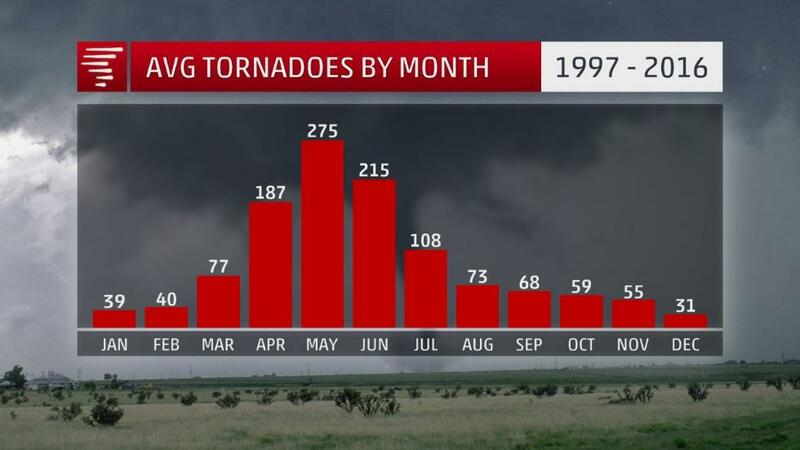 This is followed by June and April, which average 215 and 187 tornadoes per year, respectively. US tornado season: Number of tornado by months.. April, May and June are the most active and dangerous months in the year. The sheer number of tornadoes from April through June isn’t the only thing that makes this such a dangerous time of year – tornado intensity is also a factor. About 58 percent of all twisters rated F3/EF3 or stronger (1950-2012) touched down in those three months. This rises to 69 percent when examining tornadoes F4/EF4 or stronger. The most violent F5/EF5 rating has been assigned to 59 tornadoes dating back to 1950, and all but 10 of those occurred in April, May or June. All tornadoes pose a threat, but intense twisters account for a higher number of fatalities and damage. 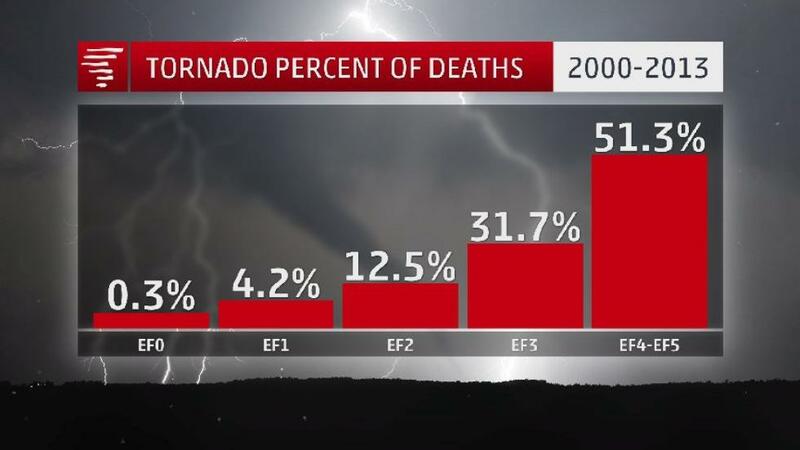 About 83 percent of the deaths from 2000 through 2013 were from tornadoes rated EF3 or stronger. The largest percentage of tornado deaths are caused by twisters rated EF3-EF5: Eight of the 10 worst U.S. tornado outbreaks have occurred in April or May, mostly due to the fact that upper echelon tornado intensities are more likely in those months. In addition, nine of the 10 worst individual tornadoes were spawned during April, May or June. 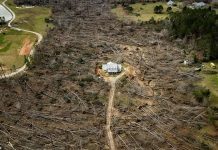 Eight of the 10 worst U.S. tornado outbreaks have occurred in April or May, mostly due to the fact that upper echelon tornado intensities are more likely in those months. 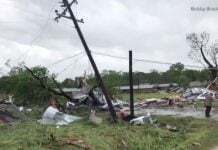 In addition, nine of the 10 worst individual tornadoes were spawned during April, May or June. The reason why tornadoes are more common in spring compared to other months is because the required atmospheric ingredients come together more often this time of year. Tornado outbreaks occur when a storm system propelled by a strong, southward dip in the jet stream punches into the Plains, Midwest or South. This is accompanied by warm and humid air flowing northward out of the Gulf of Mexico. The jet stream provides deep wind shear, or changing wind speed and direction with height, supportive of rotating supercell thunderstorms. If wind shear is particularly strong in the first few thousand feet near the surface, these supercells would more likely produce tornadoes. Historically, the greatest threat of tornadic thunderstorms has migrated from the South into parts of the Plains and Midwest as we advance through April, May and June. Average tornado risk area across the United States for April, May and June: the greatest threat of tornadic thunderstorms has migrated from the South into parts of the Plains and Midwest as we advance through April, May and June. For example, the potential for tornadoes in the South is much lower in June compared to April. Although moisture is abundant across the southern region in late spring, the strong jet stream needed to help make conditions favorable for tornadic thunderstorms moves northward toward the Canadian border. Hey people get ready for an intense tornado season 2018.